This is your chance to make a difference in your health and fitness and grow environmental education in Hancock County! Sign up for the fourth annual Dani’s Dreams Walk/Run Aug. 6, 8 a.m. at New Palestine High School. The event benefits the Dani’s Dreams Outdoor Education Center at Zion Lutheran School. We are starting on Phase II and need your help with donations for an irrigation system and a Go Green Discovery Center that will focus on environmental education for grades preschool through 8 in Hancock County – with a community garden, greenhouse, interactive exhibits and experiments in solar and wind energy. 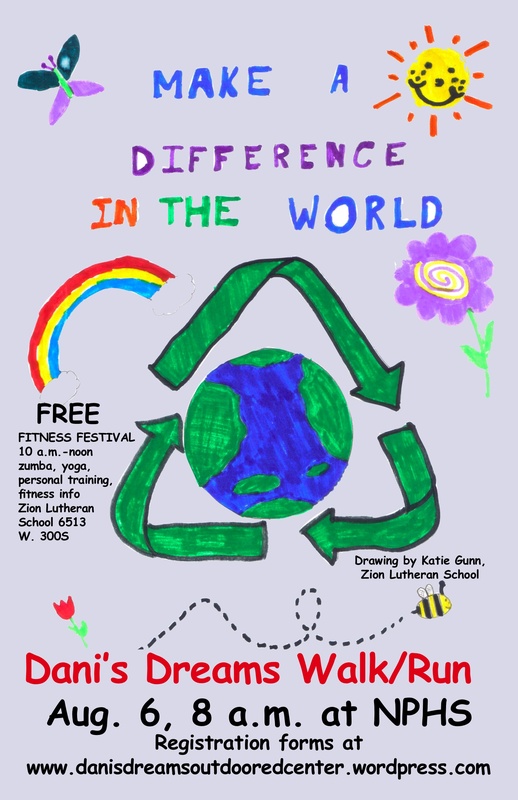 Register for the 5K walk/run or 1-mile family walk that begins 8 a.m. at NPHS and receive a cool commemorative T-shirt with this year’s theme, “Make A Difference.” The winning shirt is designed by Zion 2011 graduate Emily Kleiman. Registration for the 5K Run/Fitness Walk is only $15 Individual and $25 family. Pre-registration includes a specially-designed commemorative T-shirt; No T-shirts guaranteed for race day registration. Family registration includes 2 T-shirts. Pre-registration ends July 29. Registration after 7/29 and on race day is $20 individual; $30 family.